Home Contests OpenIDEO/BridgeBuilders Challenges 2018 for civil society organizations worldwide. 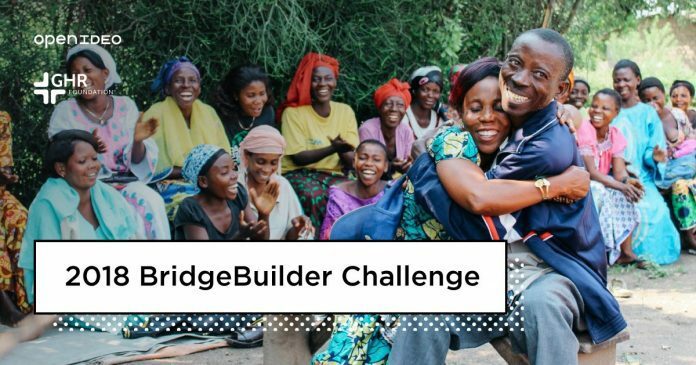 OpenIDEO/BridgeBuilders Challenges 2018 for civil society organizations worldwide. Global challenges are complex and interwoven, and cannot be solved in isolation. Whether working to advance peace, ensure prosperity, or protect our planet, there is a need to design and build approaches that incorporate multiple perspectives, keeping pace with the speed at which the global community is moving and evolving. Therefore, building and maintaining connections between people and issue areas is essential. Throughout the innovation Challenge, we refer to this as ‘bridging’ work. Submissions are welcome from registered nonprofit, civil society, community-based, and for-profit organizations working anywhere in the United States or around the world. Bridge two or more topic areas: Ideas must address two or more of the topic areas (peace, prosperity, and planet). Originality: Ideas should also strive to build and repair unique bridges between people, issues, and beliefs that promote meaningful engagement, greater social cohesion, and sustainable, community-led change. Actionable and tangible: Ideas must be actionable and center on tangible results in the community of focus (rather than research, convenings, policy development, or advocacy). Within funding scope: Ideas that can be implemented within a 36 month timeline and budget requests of less than US$500,000. Receive ongoing partnership support from GHR Foundation, potential connection to other funder networks, and media exposure. During the Ideas Phase, we’ll call on our global community to share ideas that bring people together to address urgent challenges at the intersections of peace, prosperity, and planet in radically new ways. The ideas do not need to be perfect or fully polished—in fact, we encourage early entry in the Ideas phase so that Community engagement will allow you to iterate and improve your idea. With help from our Challenge sponsor, we’ll select a shortlist of submitted ideas that will move into the Beneficiary Feedback Phase. During Beneficiary Feedback, we’ll ask contributors to test ideas in their communities and apply feedback to their proposal. Shortlisted participants will be expected to participate fully in gathering user feedback at the community level. During the Expert Feedback Phase, shortlisted ideas will have the opportunity to be matched with experts from various fields to gather feedback and additional insights. After expert feedback, we’ll open the Improve Phase, during which each idea will have three weeks to apply the expert feedback to their proposal, finalize it and resubmit it along with a project budget. After these phases, we’ll review the shortlist with our Challenge sponsor, evaluate the ideas using our criteria, and announce the Top Ideas—a set of solutions representing promising innovations that best reflect the spirit of BridgeBuilder. Top Ideas will receive seed funding and post-Challenge support from GHR, as well as ongoing connection opportunities with other BridgeBuilders and OpenIDEO. Previous articleShell Petroleum Development Company (SPDC) 2018/2019 Postgraduate Research Internship and Sabbatical Attachment Programmes for University Students & Lecturers.